Ramkinkar Baij (1904-84), experimented with a wide range of formal approaches to evolve his practice in sculpture and painting. Vivan Sundaram a contemporary artist, in collaboration with theatre practitioners, writers and artists, conceives an project 409 RAMKINKARS – a re-take on the life and works of Ramkinkar Baij. Theatre directors Anuradha Kapur, Santanu Bose, Aditee Biswas and Deepan Sivaraman, with 30 professional actors, associates and technicians, conceptualize a promenade theatre. The script is by Belinder Dhanoa. SANTHAL FAMILY TO MILL RE-CALL is a film based on the process, performance and exhibition of 409 RAMKINKARS. 44 minutes, English, Bengali (Subtitled in English), 2016. Among the various films made by the renowned filmmaker Mrinal Sen, ‘Bhuvan Shome’ made in 1969, financed by the Government of India, was a landmark film for its innovation and experimentation, setting the path for the Indian New Wave Cinema Movement. 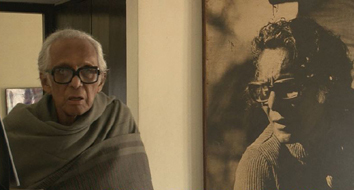 In 2013, Films Division, a Government of India Undertaking, decides to make a documentary film on Mrinal Sen. Officials from the Films Division go to Mrinal Sen’s house in Kolkata to officially propose the making of the documentary film on him. I go along with them. 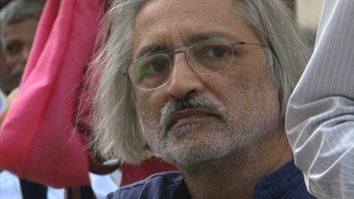 Anand Patwardhan has been making and screening documentary films as an extension of his socio-political activism, for over forty years now. In what appears to be a rare encounter between two filmmakers, R.V. Ramani, a cinematographer and an auteur in his own right, decides to engage in a ‘visual conversation’ with Anand Patwardhan, as the latter goes about screening his films across diverse audiences in the country. The film unfolds a range of poignant perspectives around Anand’s screening events and seems to raise primary questions in documentary filmmaking and representational politics. Produced by PSBT, Supported by AND, Busan International Film Festival. The film shares special moments that the filmmaker experienced with his camera, a special bonding over a period of 4 years, in terms of creating cinematic imagery, relating, exploring, seeking and interpreting notions of his reality. 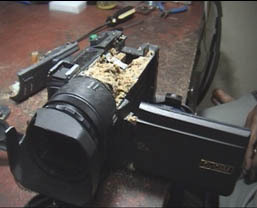 It is a memory of a camera which perished in the Tsunami, along with its last filmed footage. 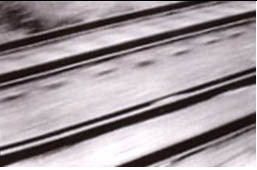 It’s last recorded footage, an elusive image, evoking multiple possibilities, seeking parallels and new perspectives. 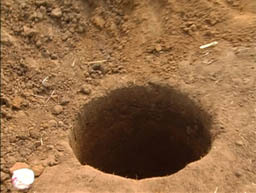 Holes dug across the ground for a temple festival, lies shattered at the end of it forming huge craters. A filmmaker’s expedition across the State of Rajasthan, trying to map the terrain, reveals inherent contradictions in the various value systems and stereo types which are projected and encountered upon. The film reflects upon definitions of bravery, notions of tourism, caste and gender politics,construction of history and personal liberty. Filmmaker Saratchandran discusses various aspects of making his film on John Abraham, the dilemmas he faced in a conversation with RV Ramani. 29 minutes, Hindi, Tamil, English (Subtitled in English), 2010. Children lodged at the Govt Remand Homes in Chennai, are brought there under various charges. Caught between the boundaries of the States and law, the Remand Home is a space in transit for the children. Some children find their way back home, some find State adoption, but for many it is a journey to nowhere. 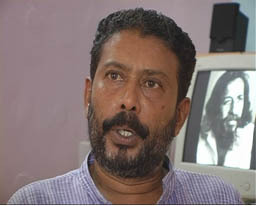 120 minutes,Tamil,Malayalam, English (Subtitled in English), 2009. 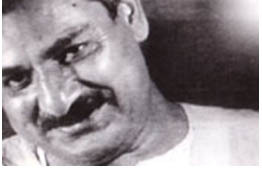 Sundara Ramaswamy (SuRa) is considered as one of the foremost Tamil modernist writers. Having brought up in the background of Malayalam language and culture, SuRa learnt Tamil by himself, emerging as a Tamil writer by sheer hard work and passion. He championed a vision, where readers can access important writings in different Indian languages. In the back drop of the Dravidian and Dalit movements in Tamil Nadu, SuRa struggled to evolve a modern Tamil literature, independent of its ancient tradition and its associated politics. This often found his writings pitted against his Brahmin background and upbringing. Sundara Ramaswamy, died at the age of 75, on October 15th 2005. As per his last wishes; his cremation was carried out without any rituals. 30 minutes, English, Hindi,(Subtitled in English), 2006. Indian and International participants comprising of students, writers, intellectuals, artists, performers, activists, filmmakers, politicians, debate, explore, express, argue, celebrate – various issues and aspects of city dwelling at the Katha Asia International Utsav festival, New Delhi, on the theme ‘Writing the City, Transforming the City’, organized by Katha. 30 minutes,English, hindi, (Subtitled in English), 2008. 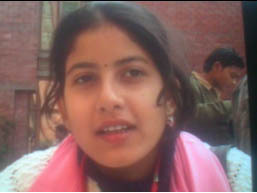 The film portrays the unique methodology of teaching, curriculum and the pedagogy at Kathashala, a school that is primarily designed for working with children from non-literate families, living in the colonies of Delhi. The effort in Katha over the last twelve years has always been to ensure a quality in our education so that it is good, relevant and fun. 150 minutes, Tamil, Marathi, Hindi, Kannada, Malayalam, Telugu. (Subtitled in English), 2003. Before the advent of cinema,Shadow Puppet Theatre, has been prevalent and most popular, for many centuries in India.The Shadow Puppeteers are the ‘original filmmakers’,who by manipulating leather puppets in front of a light source,created moving images on the screen.They led a nomadic life style,traveling,camping,setting up screens, and performing the story of Ramayana,adapting local languages and flavors. Today,there are only a few shadow puppeteers still practicing this art form. Stories and life styles have changed.This film is a celebration and dedication to the art of moving images, its original practitioners and community. It’s a travelogue through the regions of South India, unfolding the story of the traditional shadow puppeteers in many layers, touching upon the puppeteer’s lives,their performances and struggles. It’s an impressionistic ethnography reflecting on shadow puppet theatre,history,mythology,cinema and our lives. 30 minutes,Tamil, English, (Subtitled in English), 2002. Part support from Arangham Trust. Kaisiki Natakam,which is traced back to the 13th century, tells the story of Nambaduvan, who devoted one night every year, on Kaisiki Ekadasi, to singing the praises of Lord Nambi Perumal.An effort to revive and revitalize the Kaisiki Natakam tradition at Thirukkurangudi, was started in 1996 and it continue every year. 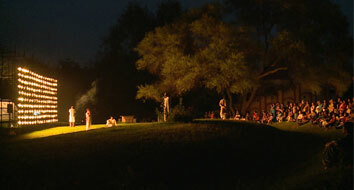 Both traditional and newly trained artists participate in the performance. This film is based on the performance of Kaisiki Natakam at Thirukkurangudi in 2001. 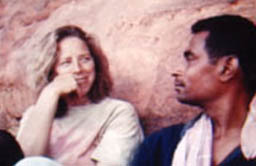 60 minutes,Tamil & English,(Subtitled in English), 2001. Edited by Sunil Kumar, R.V.Ramani, Ulrike Arnold Produced by R.V.Ramani and Ulrike Arnold. Supported by Goethe Institute. The German Nature artist Ulrike Arnold, chooses to work in South India. 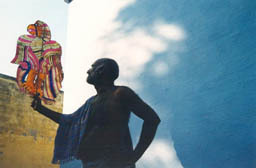 In Tiruvannamalai, Ulrike creates a unique painting, collecting soil from 4 directions of the holy mountain Arunachala. In Badami, she paints on the rock surface, near the pre-historic Siddlapadi cave, using colors found in the terrain. 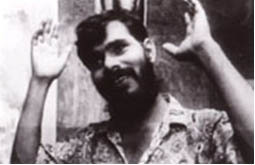 This film is a unique collaboration, between the artist and the filmmaker, bordering on mystic experiences. 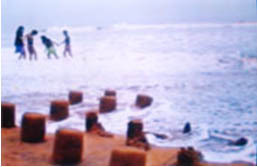 The filmmaker persuades his Japanese sculptor friend, Toshikazu Kanai, to work with sand as the medium, near the waterfront on a beach. The waves lash. Children jump around. Fish gets caught. A balloon girl passes. A film happens, revealing the process of creation, sustenance and destruction, all happening at the same time. 20 minutes, (English Subtitled), 1999. A painting exhibition displays old drawings of Mahatma Gandhi, done in 1960 by the eminent Chennai based artist K.M.Adimoolam. 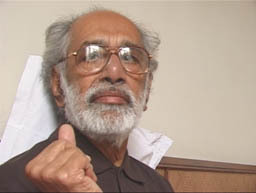 At the suggestion of the filmmaker, after a gap of almost 3 decades, K.M. Adimoolam once again attempts to do a sketch of Gandhi. The film reflects upon the spirit of Mahatma Gandhi through the drawings of Adimoolam. 20 minutes, with (English subtitled), 2000. Partly Commissioned by Arangham Trust. 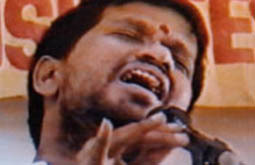 The air is potent, during The Other Festival, Chennai, 1999. The artists are involved in their last minute preparations. The filmmaker enters this potent space. The artists respond revealing their own characters and reflecting their performances. 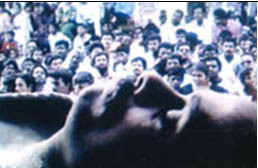 180 minutes, Tamil,with (English Subtitled), 1997. Photographed, Directed and Produced by R.V.Ramani. ‘Margazhi’ the Tamil month is the time for celebration. It also is the time for a community to assert their presence with musicians, dancers and rasikas. Around this time, more than 1000 performances takes place in different parts of the city, organized by various ‘Sabhas’. 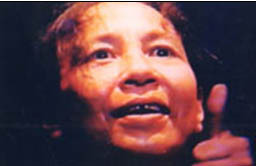 Journeying through the ambience of the 1996 December Music Season, moving from one artist to another, before/during/after the performances, the film attempts to portray the very essence of the culture that prevails during the Season. The film features rare candid moments with Vidhya Sridhar, M.S Sashank, E Gayathri, Anita Ratnam, Kadri Gopalnath, A. Kanyakumari, Srilatha Suresh, Kelucharan Mahapatra, Sanjay Subramaniam, T. Vishwanathan, Sikkil Sisters, Bombay Jayashree, S.Sowmya, Neiveli Santanagopalan, Sudha Raghunathan, T.N. Seshagopalan, Amjad Ali Khan, Shobana, P.Unnikrishnan, Chitra Visweswaran, Aruna Sayeeram, Lakshmi Knight, N. Ravikiran, T.M. Krishna, Leela Samson, Balamurali Krishna, Semmangudi Srinivasa Iyer and many more. 90 minutes, Tamil & English (English Subtitled), 1996. Shihan Hussaini, a Karate exponent and an aspiring actor, performs ‘sensational’ events, to draw attention to issues that he considers important. 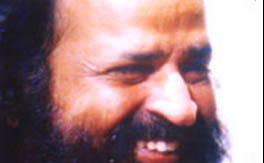 The filmmaker portrays Hussaini as a performer of bizarre proportions, struggling for an expression and identity in the social, glamour and the political arena of Tamil Nadu. 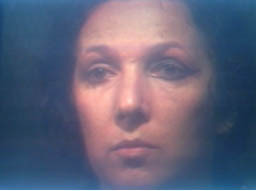 The film is in two parts. 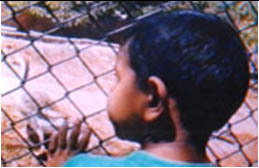 70 minutes, Tamil, (English Subtitled), 1996. 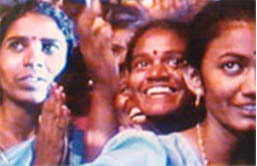 This film is based on the by-election held at the Mylapore constituency, Chennai in 1994,when the AIADMK party has been in power, with J.Jayalalitha as the Chief Minister.Mylapore by-election became a symbolic fight for all the Parties to assert their presence,for the coming of General elections.The film portrays the character of Tamil Nadu politics,people’s need for leaders,gods and celebrations. 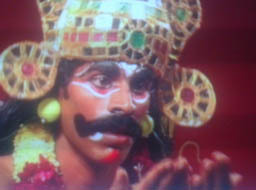 The film is based on the rehearsals of a bilingual play, ‘Gita – an Imagery’,directed by H.Kanhaialal.The play, based on the Mahabharatha war, in Tamil and Manipuri, portrays Arjuna, the protoganist in a dilemma – morality or duty.The filmmaker compares the struggle of Arjuna in the war, with that of the actors and the director of the play,struggling to seek an expression in regional language theatre. The rehearsals become performance. 5 minutes, No Dialogues, 1995. The painter, Achyuthan Kudallur, inaugurates his exhibition of abstract paintings, in Chennai. The filmmaker goes on a quizzical journey, through colors, forms, space, movements and gestures at the exhibition. A film as an abstract. 28 minutes, Video, Tamil/English, (English Subtitled), 1995. Neela dreams, snake drank water, rabbit woke up, monkey jumped. The filmmaker inspired by an Illustrator’s Workshop for children’s story books in Chennai, goes on an exploration into the world of children and their school life. 25 minutes, with (English Subtitled), 1995. Nine Experimental theatre groups from different parts of the country, who are supported by The Ford Foundation, meet in Chennai, for a Network meeting. They present a play on one script. Egos clash, fuse and melt. A film as theatre. Photographed, Edited, Directed and Produced by R.V.Ramani. 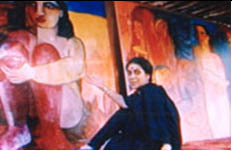 Nine painters – Tina Juretzek,Vasudha Thozur,Gieve Patel,Manu Parekh,V.Ramesh,Vasudev,Gargi Raina, Rekha Rodwittiya and Gerhard Scharnhorst – with their preoccupations in an Artists camp, held in Chennai. The filmmaker with his own preoccupation strikes a relation. 30 minutes, English, Tamil, Marathi (Subtitled in English), 1993. Bhagwan Chavan paints a large canvas for 3 days, at the Kala Mela, Art festival in Chennai. 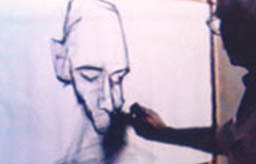 The film reflects the festival mood and his painting. After a gap of 8 months, he completes the painting at his studio. A major earthquake near his hometown in Maharashtra at the same time totally changes his feelings towards the canvas – a film along with the canvas. 25 minutes, Music and effects, 1991. A man sings in the local train, in Bombay. Men and women dance celebrating the Holi festival in the village Salona, in Maharashtra. Ganesh festival celebrations reach its peak on the streets of Bombay. A exploratory journey seeking one’s own rhythm, through the magnetic flux of rural and urban rhythms.